^ 1.0 1.1 1.2 BBC. 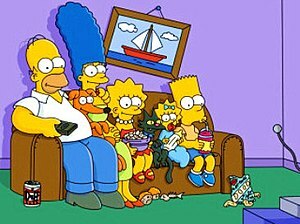 'The Simpsons': America's First Family (6 minute edit for the season 1 DVD) (DVD)使用|format=需要含有|url= (帮助). UK: 20th Century Fox. 2000. ^ Seidman, Robert. FOX Announces 2011 Fall TV Premiere Dates. TV By the Numbers. 2011-06-23 [2011-06-23]. ^ Goldman, Eric. 20th at Comic-Con: Terra Nova, Family Guy, Glee, Futurama, More - TV News at IGN. IGN. 2011-05-24 [2011-06-18]. ^ 6.0 6.1 6.2 Owen, Rob. TV Notes: 'Simpsons' breaks record with contract renewal. Pittsburgh Post-Gazette. 2003-01-21 [2006-12-19]. ^ 7.0 7.1 Folkard, Claire. Guinness World Records 2006. Bantam USA. 2006. ISBN 978-0-553-58906-1. ^ Groening, Matt. Fresh Air (訪談者 : David Bianculli). 2003-02-14 [2007-08-08]. National Public Radio. WHYY. Philadelphia. ^ Kuipers, Dean. '3rd Degree: Harry Shearer'. Los Angeles: City Beat. 2004-04-15 [2006-09-01]. （原始内容存档于2006-07-17）. ^ 10.0 10.1 Tucker, Ken. Toon Terrific. Entertainment Weekly. 1993-03-12: 48(3). ^ Groening, Matt. The Simpsons season 1 DVD commentary for the episode "Some Enchanted Evening" (DVD). 20th Century Fox. 2001. ^ 14.0 14.1 Rabin, Nathan. 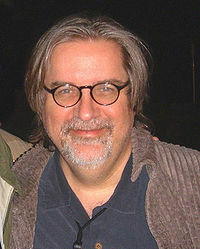 Matt Groening: Interview. 影音俱樂部. 2006-04-26 [2006-10-22]. （原始内容存档于2006-10-25）. ^ Spotnitz, Frank. Eat my shorts!. Entertainment Weekly. 1992-10-23: 8(1). ^ Rosenbaum, Martin. Is The Simpsons still subversive?. BBC News. 2007-06-29 [2007-08-06]. ^ 18.0 18.1 18.2 18.3 Griffiths, Nick. America's First Family. The Times Magazine. 2000-04-15: 25, 27–28. ^ Dan Snierson. D'Oh!. Entertainment Weekly. [2007-10-21]. （原始内容存档于2014-08-01）. ^ Cagle, Daryl. The David Silverman Interview. MSNBC. [2005-11-30]. （原始内容存档于2005-11-30）. ^ Mitchell, Gail. Mike Scully. Ultimate TV. 1999-01-24. ^ 22.0 22.1 Owen, David. Taking Humor Seriously. The New Yorker. 2000-03-13. ^ Nixon, Geoff. Mmmmmm... pop culture. The Silhouette. 2004-03-04. ^ McGinty, Stephen. The icing on the Simpsons' cake. Scotsman. 2005-01-04 [2007-08-10]. ^ Gervais writing Simpsons episode. BBC News. 2004-12-23 [2006-12-29]. ^ Azaria, Hank. Fresh Air (訪談者 : Terry Gross). 2004-12-06 [2007-08-15]. National Public Radio. WHHY. Philadelphia. ^ Groening, Matt; James L. Brooks, David Silverman. The Simpsons season 1 DVD commentary for the episode "Simpsons Roasting on an Open Fire" (DVD). 20th Century Fox. 2001. ^ Groening, Matt; Jay Kogen, Wallace Wolodarsky, Al Jean, David Silverman. The Simpsons season 2 DVD commentary for the episode "Old Money" (DVD). 20th Century Fox. 2002. ^ O'Niel, Tom. Shearer snubbed again! Blame that Mr. Burns?. The Envelope. 2006-07-20 [2007-08-10]. ^ Finley, Adam. The Five: Great Simpsons guest stars. TV Squad. 2006-06-20 [2007-08-10]. （原始内容存档于2009-07-15）. 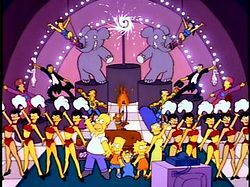 ^ 35.0 35.1 THE SIMPSONS - Season 19 (2007-2008. FoxFlash. [2007-10-21]. （原始内容存档于2007-12-17）. ^ McGinnis, Rick. Star talks Simpsons. metro. 2004-08-09. ^ Kay, Jonathan. Caste Of Characters. Saturday Night Magazine. 2000-09-09 [2007-08-07]. （原始内容存档于2008-02-10）. ^ El-Rashidi, Yasmine. D'oh! Arabized Simpsons not getting many laughs. Pittsburgh Post-Gazette. 2005-10-14 [2007-08-07]. ^ 李昀澔. 時事梗爆笑 辛普森家庭翻紅. 台灣醒報. 2014-01-14. ^ 41.0 41.1 41.2 41.3 41.4 Deneroff, Harvey. Matt Groening's Baby Turns 10. Animation Magazine, Vol. 14, #1. January 2000: 10, 12. ^ 'The Simpsons' Producer Changes Animation Firms. Los Angeles Times. 1992-01-21. ^ Groening, Matt; Al Jean, Jeffrey Lynch, Mike Reiss, David Silverman. The Simpsons season 4 DVD commentary for the episode "Whacking Day" (DVD). 20th Century Fox. 2004. ^ Geographic Names Information System Feature Query Results. US Geological Survey. [2007-06-05]. ^ Hamilton, Don. Matt Groening’s Portland. Portland Tribune. 2002-07-19 [2007-08-04]. （原始内容存档于2009-12-01）. ^ Pinsky, Mark I. The Gospel According to Homer. Orlando Sentinel. 1999-08-15. ^ 59.0 59.1 Top titles. BBC. [2007-08-01]. ^ Glionna, John M. Danny Elfman in the L.A. Times. Danny Elfman's Music For A Darkened People. 1999 [2006-07-03]. （原始内容存档于2011-10-01）. ^ Martyn, Warren; Wood, Adrian. The Simpsons Halloween Special. BBC. 2000 [2007-11-09]. ^ Macintyre, Ben. Last word: Any word that embiggens the vocabulary is cromulent with me. The Times. 2007-08-11. The Simpsons has apparently taken over from Shakespeare and the Bible as our culture's greatest source of idioms, catchphrases and sundry other textual allusions. ^ It's in the dictionary, d'oh!. BBC News. 2001-06-14 [2006-12-24]. ^ Simon, Jeremy. 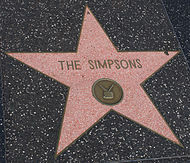 Wisdom from The Simpsons' 'D'ohh' boy (Interview)使用|format=需要含有|url= (帮助). The Daily Northwestern. 1994-02-11. ^ Vitti, Jon. The Simpsons The Complete First Season DVD commentary for the episode "Bart the Genius" (DVD). 20th Century Fox. 2001. ^ The British government welcomes our new insect overlords. New Scientist magazine. [2007-10-14]. ^ Michael Hann. Meh - the word that's sweeping the internet. The Guardian. 2007-03-05 [2007-10-14]. ^ Richard Corliss. The Simpsons Did It!. TIME. 2007-07-29 [2007-08-01]. ^ Wallenstein, Andrew. 'Malcolm in the Middle': trite Fox fare with a first-rate time slot. Media Life Magazine. [2006-07-03]. （原始内容存档于2007-09-30）. ^ Schuchardt, Richard. Ricky Gervais Part One. DVDActive.com. [2006-12-20]. ^ Legacy: 20th Annual Annie Award Nominees and Winners (1992). Annie Awards. [2007-10-16]. （原始内容存档于2012-06-29）. ^ George Foster Peabody Award Winners (PDF). Peabody.uga.edu. [2006-10-15]. （原始内容 (PDF)存档于2011-07-26）. ^ Corliss, Richard. Bart Simpson. TIME. 1998-06-08 [2006-07-03]. （原始内容存档于2007-05-29）. ^ The 50 Greatest TV Icons. Entertainment Weekly. [2007-11-15]. ^ TV Guide's 50 Greatest TV Shows of All Time. TV Guide. 2002-05-04. ^ The 100 Best TV Shows of All-TIME. TIME. [2007-01-10]. ^ Scooby-Doo breaks cartoon record. BBC. 2004-10-25 [2006-08-21]. ^ 92.0 92.1 Andy Vineberg. Some records will last forever. PhillyBurbs.com. 2007-11-15 [2007-11-17]. （原始内容存档于2008-12-16）. ^ Remington, Bob. It's The Simpsons, Man. TV Times (Calgary Herald). 1990-10-26: 10. ^ Suellentrop, Chris. Who turned America's best TV show into a cartoon?. Slate. 2003-02-12 [2006-07-03]. ^ Weinman, Jaime J. Worst Episode Ever. Salon.com. 2000-01-24 [2006-07-03]. （原始内容存档于2006-08-18）. ^ Paakkinen, Jouni. 10 fan favorites. USA Today. 2003-02-06 [2006-07-03]. ^ 15 writer favorites. USA Today. 2003-02-06 [2006-07-03]. ^ Leggett, Chris. Harry Shearer. UK Teletext. 2004-08-04. I rate the last three seasons as among the worst, so Season Four looks very good to me now. ^ Adalian, Josef. Universal launches 'Simpsons' ride. Variety. 2007-04-24 [2007-08-06]. ^ Sexton, Timothy. Simpsons Board and Trivia Games Are Fun for the Whole Family. Associated Content. 2005-08-30 [2006-07-03]. （原始内容存档于2007-05-24）. ^ Shutt, Craig. Sundays with the Simpsons. MSNBC. [2007-07-08]. （原始内容存档于2007-07-08）. ^ Bird, Brad; Matt Groening. The Simpsons season 2 DVD commentary for the special feature "Do the Bartman" (DVD). 20th Century Fox. 2002. ^ Number 1 Singles - 1990s. Official Chart Company. [2007-08-01]. （原始内容存档于2008-12-17）. ^ Certified Awards. BPI. [2007-08-01]. （原始内容存档于2008-05-25）. ^ 7-Eleven Becomes Kwik-E-Mart for 'Simpsons Movie' Promotion. Fox News. 2007-07-01 [2007-07-03]. （原始内容存档于2007-07-04）. ^ Lambert, David. Chapelle's Show—S1 DVD Passes The Simpsons As #1 All-Time TV-DVD; Celebrates by Announcing Season 2!. TVshowsonDVD.com. 2004-09-19 [2006-07-03]. （原始内容存档于2007年8月15日）. ^ DVD release dates 页面存档备份，存于互联网档案馆 at TVShowsOnDVD.com. Retrieved on June 7, 2006. ^ Stern Pinball, Inc. Announces A Wild "Simpsons Pinball Party". Stern Pinball, Inc. [2007-08-12]. ^ 112.0 112.1 112.2 Fleming, Michael. Homer going to bat in '07. Variety.com. 2006-04-02 [2006-07-03]. ^ Groening, Matt; Al Jean, Mark Kirkland, David Silverman. The Simpsons season 4 DVD commentary for the episode "Kamp Krusty" (DVD). 20th Century Fox. 2004. ^ Simpsons launch hits Springfield. BBC News. 2007-07-21 [2007-07-22]. ^ Weekend Box Office July 27–29, 2007. Box Office Mojo. [2007-07-29]. ^ Joshua Rich. Raking in the d'oh!. Entertainment Weekly. [2007-07-30]. ^ Frank Segers. "Simpsons Movie" rules foreign box office. Reuters. 2007-07-29 [2007-07-30]. ^ Patrick Kolan. Simpsons Movie Breaks Records. IGN. 2007-07-30 [2007-07-31]. ^ The Simpsons Movie. Box Office Mojo. [2007-12-17]. Alberti, John (ed.). Leaving Springfield: 'The Simpsons' and the Possibility of Oppositional Culture. Wayne State University Press. 2003. ISBN 978-0-8143-2849-1. Turner, Chris. Planet Simpson: How a Cartoon Masterpiece Documented an Era and Defined a Generation. Random House of Canada. ISBN 978-0-679-31318-2. Gray, Jonathan. Watching with The Simpsons: Television, Parody, and Intertextuality. 2006. ISBN 978-0-415-36202-3. Irwin, William; Mark T. Conrad; Aeon Skoble (eds.) (1999). The Simpsons and Philosophy: The D'oh! of Homer. Chicago: Open Court. ISBN 978-0-8126-9433-8. Keller, Beth L. The Gospel According to Bart: Examining the Religious Elements of The Simpsons. Regent University. 1992. ISBN 978-0-8126-9433-8. Keslowitz, Steven. The Simpsons And Society: An Analysis Of Our Favorite Family And Its Influence In Contemporary Society. Hats Off Books. 2003. ISBN 978-1-58736-253-8. Pinsky, Mark I. The Gospel According to The Simpsons: The Spiritual Life of the World's Most Animated Family. ISBN 978-0-664-22419-6.